When is the Best time to Visit Gurez Valley? Continuing from the previous article where I talked about how you can plan to visit Gurez; in this post I will provide a more detailed information on how the weather trends in Gurez throughout the year; and which months can be considered as the best time to visit Gurez Valley. You should remember though that Gurez is an extremely sensitive area that runs right next to the LOC. As a matter of fact, while visiting Gurez, you will be asked to register yourself at around 15 different check posts in a matter of about 100 kilometers. That is how sensitive the region is. So, apart from the weather, when can you visit here will also majorly depend on the fact that everything is peaceful and tourists are being allowed. 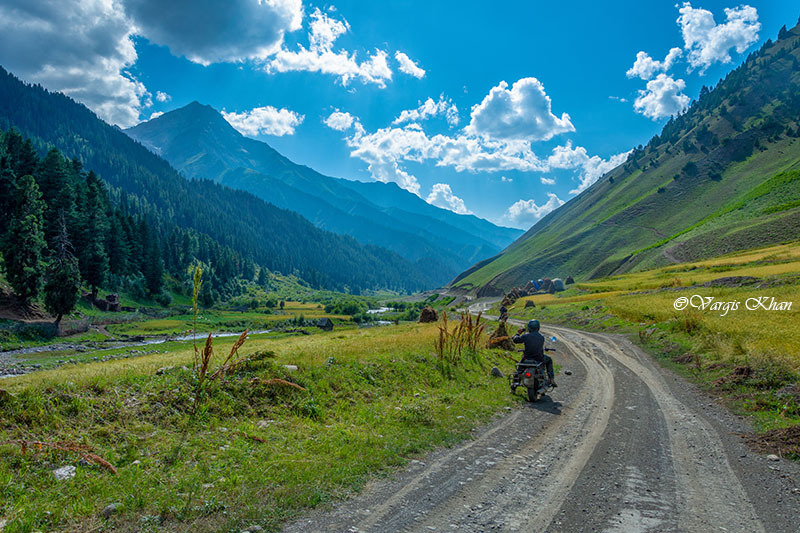 Considering all of the above and assuming that there is no unrest anywhere in the valley; below is a month by month breakdown of the weather in Gurez valley; along with a few other tips that can help you determine the best time to travel here. The first thing to note here is that the frequency of public transport to Gurez is not that great. There is no direct bus from Srinagar to anywhere in Gurez Valley. You may find a bus to any of the places in between near Wular Lake like Brar, Hajan or Bandipora but not all the way to Gurez valley. There is an early morning bus from Srinagar to Bandipore but for rest of the journey, you will actually be depending entirely on shared taxis; frequency of which too is not that great. From Bandipore as well, there is a morning bus to Dawar but it will be gone by the time you arrive here from Srinagar. So in case you are traveling by public transport, you will first have to arrive at Bandipore by Bus; and then look for a shared cab to Dawar from there. Alternatively, If within budget, you can also rent a private taxi from Srinagar for around Rs. 5,000. Or you can also avail the helicopter service to Gurez from Srinagar for Rs. 3,000 per person; or for Rs. 2,000 per person from Bandipore. Secondly, Gurez remains closed during winter after it starts to snow at Razdan Pass. During this time, there is absolutely no way to enter the valley by road. Last but not the least, Army can restrict tourist movement anytime if there was any militancy related incident; or resulting unrest in Kashmir. Even if it wasn’t officially closed, you may still be turned back from any of the numerous check posts on the way. Due to its high altitude, weather of Gurez remains cold throughout the year. Even in the months of summer, you will still need a blanket to sleep in for the night and a light jacket or woolens for the day. From January till March, the entire area remains buried deep under snow. Spring arrives in April and the snow starts to melt post which the road gets opened sometime in May. Until September, weather remains pleasant and then starts to get cold again in October. Come November, it can snow here anytime blocking the road at Razdan Pass. Keeping the above facts in mind, you cannot actually visit here by road before at least April and after November. Your trip thus would have to be planned anytime from May till October. If you want to visit Gurez Valley in Winter, the only way to approach is by Helicopter from Srinagar, cost of which is around Rs. 3,000 per person from Srinagar and Rs. 2,000 per person from Bandipore. Below is how the weather trends throughout the year. Average temperature during this time is around 5 degrees Celsius. Nights will be extremely cold with temperature ranging between 0 to -5 Degrees Celsius. Day temperature will be around 9 Degrees Celsius at an average. Heavy snowfall is expected and roads remain closed. Reaching by Helicopter is the only way to get to Gurez at this time. Weather conditions will be same as January. Snow on the ground however will even be greater in February. Roads will remain blocked and average temperature will fluctuate between 5 to 10 Degrees Celsius. Night temperature however will still remain below 0. Snow will start to melt. Average temperature will rise to about 10 Degrees. Nights will still remain close to 0 Degree Celsius. By end of March, noon temperature will be around 15 Degrees Celsius. Chances of a snowfall will still remain and the road will still be closed at Razdan Pass. Spring arrives and weather starts to turn pleasant. Snow will continue to melt and restrict itself to top of the peaks. From lower areas it will mostly be all gone. Average temperature will rise to 15 – 20 Degrees during day and around 5 to 10 Degrees Celsius at nights. The weather in the month of May is very pleasant. It will still be a bit cold but the kind that makes you feel good and comfortable. The road across Razdan Pass would get open and the valley will become accessible. Average temperature will be about 25 Degrees Celsius; and nights will be at a minimum of 10 to 15 Degrees. The weather in June will be very much the same as May but even a bit warmer. Towards the end of June, temperature may even rise till 30 Degrees during noon dip down to 15 Degrees at nights. Monsoon arrives in the region in July but it don’t usually rain much in Gurez. Weather will continue to remain pleasant as the previous month of June with temperature averaging out at 30 Degrees Celsius. Whatever little rain Gurez gets makes traveling here even more difficult. The roads in the valley are all dirt which would turn into slush if it rained. On a positive side though, monsoon will also bring lush green valleys all around. The weather condition in August will pretty much be the same as July. Average temperature will still be around 30 Degrees with some chance of rainfall as well. Weather will start to turn a bit cold in September but more of a pleasant cold rather than a harsh one. Towards the beginning of the month, temperature will average at around 25 Degrees Celsius but will drop down to 20 by end of the month. Roads will remain open still. Monsoon will be gone but green will still remain in plenty. Also Read: Is it Safe to Visit Kashmir? Autumn arrives in October and also marks the beginning of winter season. All the lush green left behind by monsoon season will turn Orange and the valley will start to look like of gold. Average temperature will drop to about 15 Degrees; and nights will be at a minimum of around 5 Degree Celsius. Vistas will turn a bit dry and dull; and weather will be extremely cold. Average temperature will be around 10 Degrees Celsius. There will be chances of snowfall in the upper areas and the nights will start to turn extremely cold. By end of November, temperature will drop below 0 Degrees Celsius at night. Razdan Pass will get snowed out and valley will no longer be accessible by road. By December, it will start to snow in lower areas as well. Average temperature will drop down to around 5 Degrees Celsius with nights freezing at 0 to -5 Degrees. Even the locals in these months move to other parts of Kashmir, like Srinagar, looking for work and to escape the killing weather of Gurez. Keeping all of the above in mind, best time to Gurez valley will be anywhere between the months of May and September. Roads during this time remain open and the weather will be very pleasant. If however you want to see a Gurez buried under several feet of snow, then you can try reaching here by Helicopter either in the month of January and February. I hope the information above was of help. If you have any other questions; or need any further details; please feel free to ask in the comments section below; or at our Community Forum; and I will be glad to answer.